This Okey Dokey review was made after playing the game eight times. Okey Dokey is a cooperative limited communication card game in which you’re trying to put on successful music festival by placing cards in a 5 x 10 grid. It was designed by Hisashi Hayashi and the newest edition is published by Tasty Minstrel Games. There are three types of cards in Okay Dokey: Musician cards, Equal cards, and Reset cards. The Musician and Equal cards are what you’ll be playing from your hand. The Reset cards will be used to create the five rows you’ll be using throughout the game, with two Reset cards placed beside each row. There are five rows you’ll be playing cards to with each row representing a single suit. The rows of cards always have to be in ascending order unless you play one of the Reset cards, which are zeros and reset the order regardless of what the previous card was. You always have to complete a full five-card column before you can move on to the next column. Each column has to have four Musician cards and one Reset card. You can also play Equal cards, which have values equal to the cards on their left. You can only play two Reset cards to each row, so part of the strategy is figuring out which Reset card to use for the column you’re working on. On your turn you’ll either be playing a card from your hand to the current column you’re working on or placing a Reset card instead. After you play a card you’ll draw a new one from the deck. When you play a Reset card you’ll have the option of putting one or two cards from your hand to the bottom of the deck and drawing that many cards. This is a limited communication game, so there’s only so much you can say to your teammates. You can say how many cards you have of each suit. You can also say what suit you want to play or if you want to play a Reset card in a specific suit’s row. What you can’t do is tell your teammates the values of the cards in your hand or even hint that you have the next number in a specific suit. If you’re able to make a 5 x 10 grid following the rules mentioned above, you win! If at any point a player can’t take an action on their turn, everyone loses. I love the tension in limited communication games like Okey Dokey. You’re pretty sure you know what other people have and what you should do, but you won’t know until you actually make your move. For such a simple card game, you do have plenty to think about on your turns. There’s rarely an obvious move because you have to factor in what other players have in their hands and what you’ll be able to play on your subsequent turns. I really like how the Reset cards work. They help you when you’re in a bind but there’s also a limited supply of two for each row so you have to think about when and where to use them. It’s very easy to adjust the difficulty level to make Okey Dokey the perfect challenge for your group (if you’re playing with three or more players – see below). You can add in or subtract Equal cards or, if the game is still too easy for you, you can add in even more communication restrictions. You won’t run into any quarterbacking issues in this game. No one knows for sure what other players have, so no one can tell others what to do. If quarterbacking is your main issue with co-ops, you’ll want to give Okey Dokey (or any other limited communication game) a try. 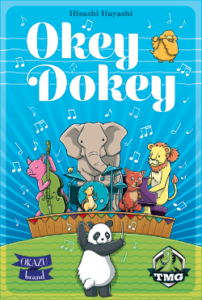 Anyone can learn how to play Okey Dokey in about two minutes, including younger kids. Solo and two-player games are a bit too easy, especially if you’ve played games like this before. The more people you have, the more challenging the game will be since you’ll have fewer cards in your hands / less information. There’s really no theme here. Well, there is, but I don’t think most people will be thinking about creating a music festival while playing this game. For a small-box card game, Okey Dokey sure does take up quite a bit of table space. The picture I posted above only shows half the size of the final grid, so you can imagine how much space it ends up covering. I usually enjoy playing limited communication games, and simple fillers seem to hit the table more than any other type of game, so I’m not surprised that Okey Dokey has gone over well with my groups. It’s light, it’s quick, and it’s a challenging card game for 3+ players. 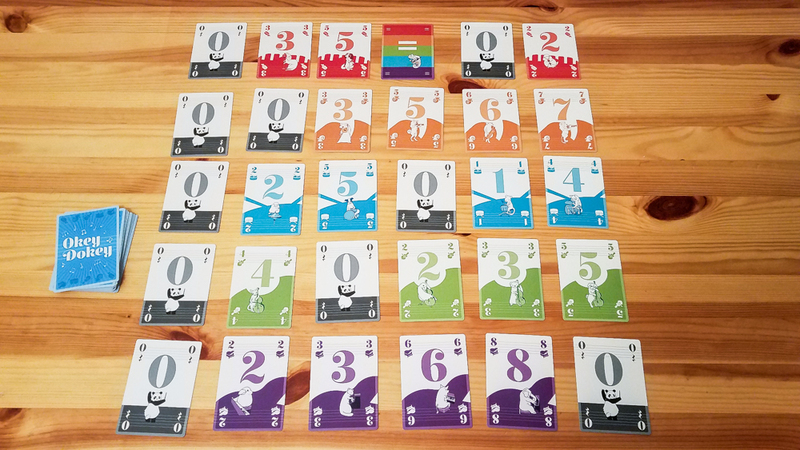 If you enjoy games like Hanabi, The Game, and Cahoots, you will probably like Okey Dokey. If you don’t like those types of games, you should pass on this one. Okey Dokey reminds me of The Game the most since both are games in which you’re trying to play numbers in order. I still prefer The Game because it’s a bit more challenging at all player counts, but I’d recommend Okey Dokey over The Game if you’re planning on playing with younger kids. I’ll be keeping both. Thanks for taking the time to read our Okey Dokey review! To stay updated on all things cooperative board games, follow us on Twitter, Facebook, or via RSS.